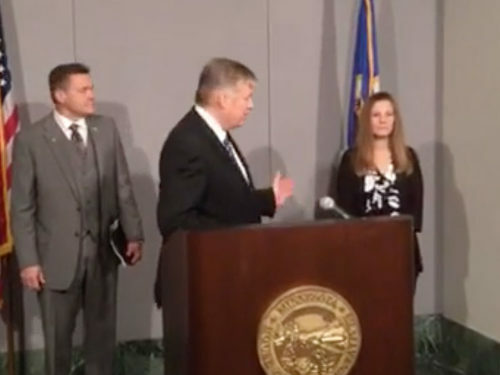 A woman in Minnesota is suing her own child, age 17, for undergoing a gender transition without her consent, according to lawyers who announced the suit at a news conference Wednesday. In every instance, attorneys and the mother herself misgendered her child, who is now living as legally female, referring to her only as her son, as a boy, and using male pronouns. In addition to attorney Erick Kaardaal, pictured above, Calgaro is working with the anti-transgender Minnesota Child Protection League and the anti-abortion group, the Thomas More Society of Chicago. NBC OUT’s Mary Emily O’Hara was first to report on the lawsuit, which also named local county health boards, a school district and health care nonprofit organizations. The news conference was streamed live on Facebook by Emily Gruenhagen. David Edwards of Transforming Families, a community-led group that “supports parents of gender-diverse kids” and himself the father of a trans child, was alarmed when O’Hara shared with him how Calgaro, the state representative and her attorney referred to her daughter. “Purposefully mis-gendering a transgender person is an act of violence,” Edwards said. “To continually do that to your child is not only insensitive but also really harmful.” Edwards added that 38 percent of the trans and gender nonconforming teens who responded to a survey said they had attempted suicide at least once. Calgaro claims this all started in 2015, when her daughter left her home to live with her father, who is separated from Calgaro. She claims her estranged husband supports her lawsuit and is opposed to their daughter’s transition, but he did attend the news conference. Phil Duran, the Legal Director at OutFront Minnesota, told NBC OUT he was perplexed at many aspects of the lawsuit. Read more at NBC OUT by clicking here.